Stargazing has indeed become very popular in all Perth tour itineraries more so since Western Australia is now considered an iconic global astronomy destination. While scientists and professional stargazers visit Perth to study and enjoy this amazing natural asset above us, many others take up star gazing as a relaxing, anti-stress hobby and spend hours and hours of enjoyment in star-gazing. Many visitors spend hours and hours gazing upon the galaxy of stars hanging static in the sky and contemplate on the wonders of our great universe. Star gazing encourages you to ponder over how these little stars influenced the lives of so many people and great nations throughout the centuries. To the ancient Greeks, stargazing was a science and they used geometry to understand the stars. They even monitored the star constellations for agricultural purposes. Sailors used stars as navigational guides on the seas, as did the early Australians, who opted to travel the land in the cool night and used the stars for navigation. In the ancient Roman era, the three wise men followed a star which led them to Bethlehem and the newborn Christ. The Incas defined seasonal changes by studying the stars. And even today in modern times, many cultures follow horoscopes based on the position of stars and planets at time of birth. Since each month is designated with a star sign, try to visualize your birth sign in the amazing blanket of brilliant stars, as particular patterns are seen only at certain times of the year. Stargazing is also considered good for one’s mental, physical and spiritual health, and then there are those whose creativity is ignited when gazing upon stars as it improves one’s focus and concentration. And for those who believe in the myth and magic of shooting stars, here is the wonderful opportunity of making your wish upon sighting a shooting star. 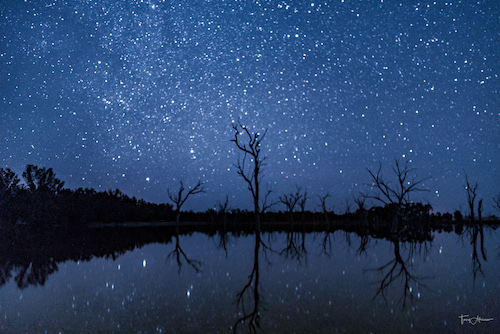 For a great stargazing experience, contact the team at Boshack Outback, or visit us at www.boshack.com to view our many tour packages, and take home with you star studded Australiana memories.